Some of you will remember that while growing in Southern California, my family owned a mobile home at Paradise Cove in Malibu. This was our beach getaway and we spent every available moment there. The beach was amazing and my most treasured memories are of the time we spent there. First boyfriend, first kiss, best friends, surfing (and cute surfers), pig roasts, luaus, first job and the list goes on and on. One memory stands out as the most unexpected and that is of The Pink Lady of Malibu. The only way to realistically get home was through Malibu Canyon and while the traffic was always heavy, on this day it crawled as everyone came out to see what all the fuss was about. There she "stood" in all her glory while onlookers and photographers captured her in their memories and on film. Guerrilla Art in the Southland: Remember Pink Lady? Artists with something to say put their mark on L.A. — welcome or not. Among the creations: a giant stamp, a 'sea monster' and the naked 60-foot woman above Malibu Canyon Road. 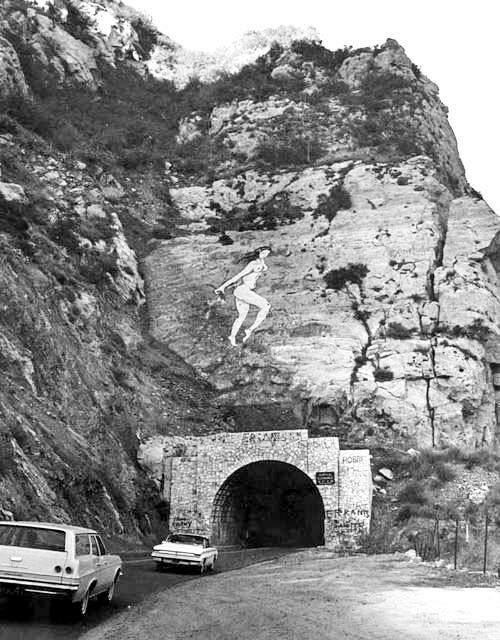 "In 1966, artist Lynne Seemayer decided she was tired of seeing graffiti on the rocks above a tunnel on Malibu Canyon Road. So she spent several months removing the writing, then painted a pink, naked woman in its place. For a few days, the 60-foot-tall Pink Lady "made more headlines in Los Angeles than President Johnson and the Beatles," The Times' Michael Arkush wrote later. 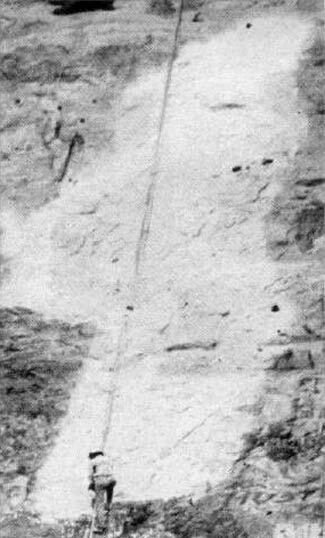 Seemayer, who painted the figure while hanging from nylon ropes attached to nearby bushes and pipes, was praised by some, condemned by others. She reported receiving marriage proposals and invitations to join nudist camps as well as death threats. In the meantime, county authorities declared the Pink Lady a traffic hazard and said she would have to go. As onlookers watched, workers sprayed her with high-powered hoses, then pelted her with paint remover. Both methods failed to erase the figure, whom The Times' Jack Smith described as "exuberant and free," holding "a sprig of wildflowers" while "her long dark tresses flowed backward." Finally, the county dispatched men in harnesses, carrying spray guns and 14 gallons of brown paint. Half a century later, you can still see a few faded splashes of pink paint above the tunnel. But the lady with the long tresses is gone, as are her wildflowers." I think my parents knew this was a work of art and didn't tell us to look away. The Pink Lady of Malibu is now a distant memory, but I enjoyed remembering her and the carefree way she danced naked across the canyon with her black hair blowing in the ocean breeze. Very neat story. I also loved hearing your sweet 'growing up' memories! Rhonda, this is a great story. How on earth did she get up there without anyone saying anything? It amazes me that she painted that mural without the police intervening. Too bad they decided it to cover it. I think she's right. I'd rather see art there than messy grafiti. It must have been fun to grow up in CA. Could you imagine if they painted over the ceiling at the Sistine Chapel because they thought it was an eyesore? ps- Thank you for your thoughtfulness. My first thought was..., hopefully she didn't turn heads! Fascinating story. My husband grew up down there; I'll ask ifhe remembers that. Wish i could have seen this myself.. although at 4 it may have had no impact!! haha and it must have been considered shocking back then!!! What an awesome story!!! Cannot wait to show my daughter in law this since they JUST moved back from there! She'll love it! And thanks for the advice on my foot. I can walk again!!! Just in time to stroll the Florida beach next week!! Mwah....I owe ya girlfriend!! What a great post! I love hearing about your childhood...and seeing Cali through your eyes. I can just imagine the heads that were turned by the pink lady. My dad would probably have run off the road! Guerilla artists struck downtown Dunedin a couple of years ago...oranges were painted on several storefronts, walls, street corners, etc. They are absolutely beautiful paintings and fit the town so well, but there sure were a lot of angry people screaming for the artists' paintbrushes! Well, those meanies! What a work of art and what neat memories! When I was a little girl, I used to dream of growing up in S. California. You were living my dream, you lucky, ducky, girl you! I love stories like that...how lucky you have the memories. Dropping back by to let you know that Mr. M. really appreciated your birthday wishes! Thanks, Rhonda! Shellbelle, what an interesting story! How in the world did she not get 'caught' and pull this off. It sure would be better than any graffiti! I just read your post below and I love the name of your home, very unique and your shell collection is gorgeous. Our house seems to be referred to as 'The Paris House' because of my business's name sometimes I call it the 'Carriage House' because It is an old carriage house that we refurbished. Let's get her Restored! Here is my Facebook page dedicated to seeing her returned to her rightful place as a part of Americana and her symbol of the free spirit of humankind!